Some solid writing on recent Championship runs by the Dallas Mavericks and Boston Bruins. 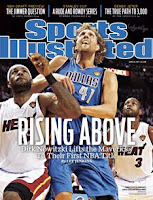 The NBA Title from the Mavs yielded the SI cover story "Lone Star Power" by Lee Jenkins. Very solid piece that conveyed the details of the Finals along with the human drama supplied by Mavericks star Dirk Nowitzki. Excellent blend of straight reporting and emotional kick from Jenkins. Reporting on the Bruins win differed in that while there was a good individual achievement piece in Sports Illustrated after the Stanley Cup Finals, it was tougher to find really good writing on the team and series as a whole. The aforementioned SI writing was "Hub Fans Bid Tim Yahoo!" by Brian Cazeneuve. Very solid recounting of the path to a championship taken by Bruins goalie and playoff MVP Tim Thomas. In terms of an overall writeup on the Bruins and the extremely compelling Finals against the Canucks, the best I came across was written for the new website Grantland. "Proud to be an NHL front-runner" was written by Bill Simmons after game four of the Finals and did an excellent job of portraying the level of nastiness in the first four games and contrasting the two teams... and why for many fans, the Bruins were an easier team to like than the Nucks. After the game seven win by the Bruins, Simmons then penned "A Black And Gold Day for Boston. Finally." also for Grantland (and from which the below image was taken). There's a lot written on Tim Thomas in the second Grantland piece (and justifiably so), but Simmons also does a solid job of linking this win to Bruins championships (and goalies) from the past. Excellent writing on two big triumphs.